Hello friends! I know I skipped yesterday because it's always Heartfelt Creations on Wednesday but today is another day in my series of Creating for Men! Today I have a fun masculine card I created using Tonic Studios products along with more of the BARC Cherry Wood Paper from ARC Crafts. My card today uses the 73E Silhouette Scenes Groom Die Set. I am not making a wedding card but I thought that the silhouette of the groom would be perfect for a masculine birthday card. What do you think? This card measures 6x6”. To create this card, I cut a piece of 12 x 12” black cardstock in half and folded it to create the base. I cut a piece of white cardstock to 5 3/4 x 5 3/4 “. Then I got busy die cutting! First I die cut the groom silhouette from black cardstock. Using the Tonic Funky Glue pen, I coated just the groom portion of this die cut and sprinkled on Nuvo 706N Charcoal Glitter. I also die cut another portion of the 73E Silhouette Scenes Groom die set from the BARC Cherry Wood Paper. Behind this die cut, I added a piece of newsprint paper. Once my groom was dry, I started assembling the card. I added some white/black twine around the cherry wood die cut and then adhered it in the middle of the white cardstock. Then I glued the groom on the left side of the cherry wood die cut so that it look liked the groom was leaning against the wood. I die cut 1180E Musical Notes Die from the BARC Cherry Wood Paper and added those as shown. Then I used some typeface letter stickers for my sentiment. Here is a closer look at the card. Hello friends! Today I have another project to share with you using some more products that are great for masculine cards. The card I have to share with you today I created using one of my favorite Tonic Studios dies and some BARC Cherry Wood Paper from ARC crafts. Creating a masculine card can sometimes be a challenge. Most of the supplies sold seem to be more for women and I have to say that creating pretty cards is my favorite. When I received some of this Cherry Wood Paper, I knew that a masculine card would be perfect for showing more ways to create masculine cards. To create this square card, I cut some kraft cardstock to 5 1/4 x 10 1/2". Then I layered my mint and patterned paper together, cutting them slightly smaller than the base. I cut a strip of the Cherry Wood Paper to 2 x 4 1/2". Using my scissors, I cut a "V" in the bottom of the strip to create the banner look. Because the wood paper has an adhesive backing, it was very simple to adhere to my card. I cut a cardstock and patterned paper banner also. Then I really had a good time. Using the 528E Star Layering Die set, I die cut a bunch of different sized stars to decorate the front of my card. I layered the stars using the wood paper, patterned paper and cardstock. All of these papers cut great using the Tonic Studios dies! Here is a close up! I added some Nuvo White Blizzard Glitter Drops to the smallest mint cardstock star and to the some of the little mint circles on the patterned paper to give it just a little glitter. You should give this ARC Crafts Cherry Wood Paper a try! The wood paper makes creating a masculine card very easy and it looks fantastic plus it is so unique! 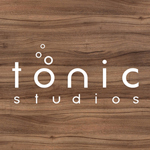 Check out the ARC blog to see the other projects they have created with Tonic Products. Hello friends! Do you struggle with creating cards for those special men in your life? I know it has been a struggle for me as I am definitely a girly artist! LOL I had a blog follower contact me to see if I would create some masculine cards for her husband's birthday. That really got me thinking about the products I use and what did I have that would be perfect for this project. So today I am highlighting the Signature Collection By Sara Davies - Just For Men from Crafter's Companion. But on Tuesday and Thursday of this week, I will also have some masculine cards to share using other products from different companies. On Amazon Prime Day, I purchased the Silhouette Mint machine and thought this would be a great project to get it out and use it. I found it fairly easy to use but really need to sit down and play just a bit more. Plus I need more stamp "blanks" to create more stamps! To create this card, I used Signature Collection by Sara Davies - Just For Men.....this is the Time Piece embossing folder. After embossing a piece of chocolate chip cardstock, I used some metallic rub-on paste to highlight the clocks. I used gold and copper. Plus I used the On Your Birthday embossing folder and just cut out the "happy birthday" and then added more metallic paste. I stamped the "My Dear Husband" onto kraft cardstock using black ink (included with the Mint) and then just cut out the sentiment. I also added some burlap behind the sentiments for more interest. I used the same On Your Birthday embossing folder plus I a piece of patterned paper from the Signature Collection by Sara Davies - Just for Men - 6x6 Urban Collection papers. This card is more of a clean and quick style but I do like it. What do you think of my stamp? Now I am going to have to find the time to really learn how to use this Silhouette Mint. I am really excited! Be sure to check back tomorrow and the rest of the week for more masculine projects!